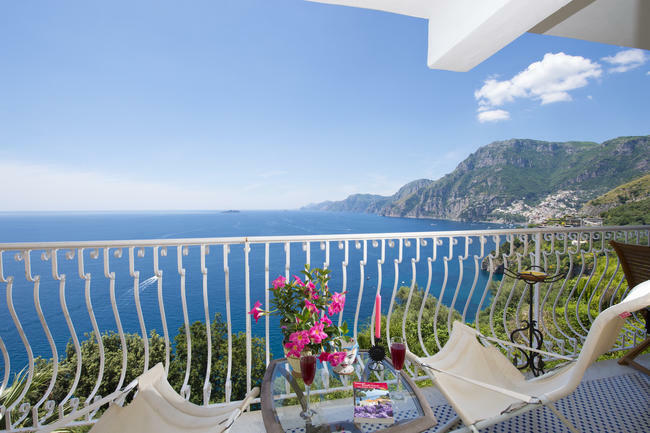 Villa Anto is a gorgeous villa situated in one of the most panoramic angles of Positano. 1 bedroom with a double bed, en-suite bathroom (with shower) and the access to the terrace. 1 bedroom with a double bed and the access to the second terrace. This room is air-conditioned. 1 large livingroom with some sofas, a fireplace and the access to the terrace. 1 kitchen, fully equipped with a gas cooker, a oven, a fridge, a freezer, a dishwasher, a microwave oven and other little home appliances. There is a dining table with chairs. It's possible to add a single bed for a fifth guest in the bigger bedroom (upon request). This villa has got two terraces in total: one in front of the house and another one on the right side. Villa Anto is furnished with air conditioning, Wifi Internet connection, satellite tv, dish washer and washing machine. It has got two parking spaces, free of charge. From this wonderful accommodation you can reach the sea by steps. It's a path, with marine pines and olive trees, composed of about 500 steps. A private rocky platform, shared with the owners and eventual guests of the other unit, where you can sunbathe and access the sea. Amazing! Villa Anto is situated at the beginning of Positano, about 2 km to the main centre. You can access the house from the parking, descending about 12 steps. Having a free parking space for your car, this villa can be a good base for your daily excursions along the Amalfi Coast. If you have no car, you can easily board the local bus. The bus stop is 20 mt away to the parking entrance.